When I was mulling over potential movies for this column -- a retrospective on the first quarter of the NBA season -- I kept coming back to "A Few Good Men." Why? Because that's what this NBA season has been all about: A few good men, and a few more, and a few more, and even a few more, and it's all added up to the most absorbing, entertaining NBA season in recent memory. 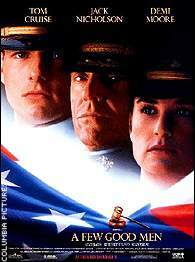 No matter how often TNT and TBS air "A Few Good Men," you're probably still going to watch it. The league has never been deeper, thanks to superb rookie classes in 1996, '98 and '99 -- Garnett, Iverson, Allen, Francis, Pierce, Nowitzki, Marion, Brand, Miller, Walker, Carter, Stojakovic, Davis, Bryant and Abdur-Rahim, plus the arrivals of Duncan and McGrady in '97. That was a four-year boom; we're just starting to reap the benefits now. Throw in some effective rule changes (zones plus the eight-second rule), and we've seen a much more engrossing brand of basketball this season -- less one-on-one stuff, more fast breaks, more drive-and-kicks and much more ball movement. It's a shame that MJ's comeback has soaked up much of the attention over these first few weeks. Anyway, since we've reached the one-quarter mark of the season, instead of handing out awards, I'm handing out 50 quotes from "A Few Good Men," maybe the greatest TBS/TNT "We know we just showed this movie three weeks ago, but dang it, we're showing it again and you'll probably watch it again" movie of all-time. I know I'm not alone here. 1. "I don't know what the hell kind of unit you're running here." 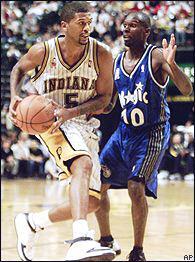 Jalen Rose and the Pacers have the talent to compete with anyone in the East. To the Indiana Pacers, the most intriguing team in the league ... and they'll probably finish 39-43 before everything's said and done. Yeah, keep switching lineups, playing 10 guys and indiscriminately benching key players at crunch time, Isiah. That stuff always works at the NBA level. 2. "You guys are going down, Danny. I can't stop it anymore." To Utah and Miami ... good luck, goodbye and good riddance. See you in the lottery. 3. "I specifically ordered those men not to touch Santiago!" The biggest lie in the movie goes to the biggest lie of the season ... that MJ was coming back to turn the Wizards around and help "teach" them on the court. Come on. I wrote it two months ago and I'll write it again: MJ came back to play himself into shape, make sure his body can hold up and eventually trade himself to a contender. Everybody wins. Just watch. 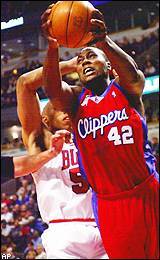 The Bulls trading away Elton Brand ranks as one of the most moronic deals in NBA history. 4. "It was oregano, Dave, it was $10 worth of oregano." 5. "Yeah, well your client thought it was marijuana." 6. "My client is a moron ... that's not against the law." To Bulls GM Jerry Krause ... who decimated the Bulls over the past three years in a "Michael Myers tearing through Haddonfield" kinda way. Can we officially dub the Elton Brand-Tyson Chandler trade as one of the worst trades in NBA history? In the history of sports, has any team ever given away a Sure Thing -- a guaranteed 20 and 10 power forward who just turned 21 this year, no less -- to roll the dice with a complete unknown whose upside wasn't any higher than what the Sure Thing was already bringing to the table? Even Ted Stepien wouldn't have made that deal. 7. "These are the facts of the case, and they are indisputable." To the Orlando Magic ... Grant Hill's ankle will never be 100 percent again. And you know it. Speaking of Smilin' Jack Ross (Kevin Bacon's character and the author of the above quote), let's just go ahead and induct the Jack Ross Face into the Pantheon of Faces right now. The vacant look on his face after Col. Jessep admits he ordered the Code Red was absolutely priceless. Ross should have been wearing an Aikman jersey. Tom Cruise was at his overacting best in "A Few Good Men." 8. "How the hell is your dad, Danny?" 9. "He passed away seven years ago." 10. "Well, don't I feel like the (bleepin' bleep)." The funniest exchange in the movie goes to the funniest ongoing subplot of the season ... The Moochie Norris Experience. His "penetration/more penetration" routine comes straight from of the '70s -- he's a cross between Tiny Archibald, Charles Johnson and Kevin Porter, but with Larry Kenon's afro. And now Stevie Franchise is out for six weeks, which means Moochie gets to run the show four nights a week! Anybody who brings back memories of the "6-foot-3 ... 6-foot-8 with the afro" scene from "Fletch" puts a hop in everybody's step. 11. "I like all you Navy boys ... every time we gotta go some place to fight, you fellas always give us a ride." My favorite hidden dig in the movie (Kiefer Sutherland's Marine lieutenant taking a shot at Tom Cruise's Navy lawyer) goes to my favorite hidden NBA player ... Keon Clark, the backup big man for Toronto. Why isn't he averaging 20 and 10 every night for somebody? It's inexplicable. Beanpole legs, jumps out of the gym, inventive on the post, great hands around the rim, always confounds teams with his "dribble to the right, pull up and launch a little lefty hook" move ... and yet he can't seem to find his "Damon and Affleck in 'Good Will Hunting' " breakout moment. 12. "If you haven't gotten a (bleep) from a superior officer, well, you're just letting the best in life pass you by ... of course, my problem is that I'm a colonel, so I guess I'll have to take cold showers until they promote some gal President." Sacramento will test the limits of the Ewing Theory when Chris Webber returns. 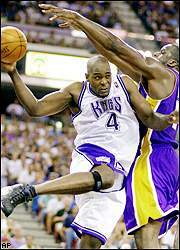 One of Colonel Jessep's finest moments goes to ... the Sacramento Kings, who deserve more praise than just about anybody for holding the fort without Chris "You Always Knew I had Ewing Theory Potential" Webber over these first five weeks. Fun team to watch. You would think C-Webb only makes them better when he returns ... but that's the great thing about the Ewing Theory. You never know. 13. "I suppose it's way too much to ask that you're making this up just to bother me." To the snake-bitten Cleveland Cavaliers ... has any team ever had three big men (Michael Doleac, DeSagana Diop and Zydrunas Ilgauskas) suffer foot fractures in the same three-month span? Who's coaching this team, Bill Walton? Who's starting the first "When will Chris Mihm fracture his foot?" office pool? 14. "I strenuously object? Is that how it works? Objection ... overruled ... no,no, no, I strenuously object." To the fans of the Orlando Magic ... this is how they must have felt when their team's front office decided, "Hey, if we don't trade somebody soon, we'll have to pay the luxury tax ... ummmm ... hey, wait a second! Let's take Bo Outlaw -- one of the best bench players in the league and somebody who would help any contender in the league for 15 to 20 minutes a game -- and we'll give him away for absolutely nothing! Yup, he's one of those guys who makes the difference between a second-round exit and an appearance in the Finals ... so let's dump him! And then we'll spin it to our fans like we're trying to create cap space for Tim Duncan in the summer of 2003. They might just be crazy enough to buy this!" 15. "That night the guys in my squad threw a blanket over me and took turns punching me in the arms for five minutes. Then they poured glue over my hands. And it worked, too, because I've never dropped my rifle since." To Lamar Odom ... his Clippers teammates should give him a Code Red to deter him from hitting the bong pipe again, because the NBA suspensions from Team Stern obviously aren't working. What a shame. One of the most talented guys in the league, and he can't seem to get his head on straight. 16. "I don't understand, how did you know where the mess hall was if it's not in this book?" 17. "Well, I guess I just followed the crowd at chow-time." 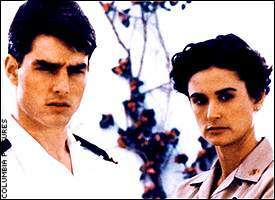 The savviest move in the movie -- a brilliant cross-examination from Cruise that turned the tables on Jack Ross' "Where's the Code Red described in the Marine Rulebook?" routine -- goes to the smartest move of the season ... the Nets importing Jason Kidd from Phoenix and immediately hooking up their franchise to the Juvenation Machine. 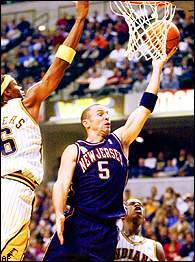 When the Nets imported Jason Kidd, they made one of the savviest moves of the offseason. 19. "Pretty much. (thinking) Yeah." To all the teams that needed a point guard and still passed on Jamaal Tinsley and/or Tony Parker from the middle of the first round on ... specifically Charlotte, Boston, Atlanta. Bonus points to Atlanta here for picking Tinsley with the 27th pick, trading his rights to Indiana and eventually unveiling an Emanual Davis/Jacque Vaughn point guard tandem to a horrified Hawks fan base (all 3,000 of them). Don't these teams have scouts? 21. "I want the truth!" 22. "You can't handle the truth!" To Alonzo Mourning ... hang it up before something bad happens to you. Please. 23. "You don't want the truth because, deep down in places you don't talk about at parties, you want me on that wall, you need me on that wall." To Charles Oakley ... who's wasting away his final days on the Bulls when a number of contenders could use him, and yet nobody has enough cap space to trade for him. Wouldn't he fit perfectly with the Lakers? Or the Sixers? Couldn't the NBA create some sort of Oakley Exception for veterans trapped on crappy teams? On the bright side, a frustrated, hostile OakMan means that somebody's getting punched soon. 24. "Harold? You don't need to wear a patch on your arm to have honor." 25. "Ten-hut! (saluting) There's an officer on deck." The most inspiring sequence of the movie goes to the most inspiring team ... the overachieving Detroit Pistons, who are becoming a legitimate threat in the East. Everybody here has something to prove, including the head coach (Rick Carlisle, snubbed by Indiana two years ago), the resident star (Jerry Stackhouse, trying to show he can lead a playoff team) and their key role players (Jon Barry, Clifford Robinson, Ben Wallace, even Chucky Atkins). It's one of those "sum is greater than the parts" teams, much like the Magic two years ago ... and in the East, that just might be enough to keep you playing into May. One last note: That scene always gets me. Ten-hut! There's an officer on deck! Somebody turn on the heat in here, because I just got the chills.